This is a reminder that our meeting next week will take place in Portstewart as above. Approaching Portstewart from Coleraine you will see the church on the left at the very outskirts of town. There is plenty of handy parking just there. If anybody needs a lift please contact the secretary email address or me and we shall sort out travel arrangements before the end of the week. The Society will be performing in support of Gary Ryan at this year’s Ards Guitar Festival on Wednesday 3rd April at 8pm in the Queen’s Hall in Newtownards. This is sure to be a great recital, so make sure you book your tickets now to avoid disappointment. Gary will also be hosting a guitar workshop on Thursday the 4th of April at 11am. An individual has approached the society with an instrument for sale – a 1975 Di Giorgio Bel Son No. 36. We have no photos as the moment but it is a very similar instrument to the one in this link. The guitar has been examined by a respected luthier and society member, and they have confirmed that the asking price is about right. Anyone interested in more information should contact the secretary email address (secretary.cgsni (at) gmail.com) in the first instance. Robbie and Keith met with Sean Woods on Tuesday to discuss what can be done this year in terms of a self-funded festival. The dates would be 24th and 25th August, the Bank Holiday weekend. Sean has some money set aside from a private business donor which could be used to bring over a professional guitarist. 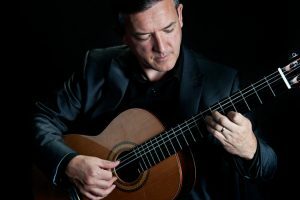 Both Carlos Bonell and Matthew McAllister have offered to support the Festival and Sean is optimistic that one of them would come and give a recital as well as teach. Otherwise the format would be similar to last year i.e. technical teaching, cluster groups with professional guitarists in attendance, ensemble, members recital. Sean will also contact the same venue we used last year (Irish Language Centre, Great James Street) to confirm that we can get the same premises at the same price. Once again, the cost of the festival would depend on the number of participants but if we can achieve similar numbers to last year the fee for the weekend would be £60. This should cover at least the hire of the premises and Sean’s fee. Please let the Secretary (Keith – email secretary.cgsni gmail.com) know whether you would be interested in attending. If we can get a reasonable number of commitments at this stage then Sean can contact a professional musician to attend the festival. It goes without saying that the more support the festival can get, the stronger it will be. Hi folks – sorry about the tumbleweeds, not much happening recently! Experienced guitar tutor Ed Mitchell will be leading a workshop for the February meeting of the society. This will be a good opportunity for learners to work through a piece in a group setting – the piece will be a study that Ed has composed himself. You can get a copy of the piece in advance by getting in touch with the Secretary. The workshop will happen on Sunday the 3rd of February at 3pm in the Ulster College of Music. Hope to see you there! Just a quick update to let any interested parties know that the Events page has been updated with the events programme for 2018/19. Have a look and put the dates in your diary! 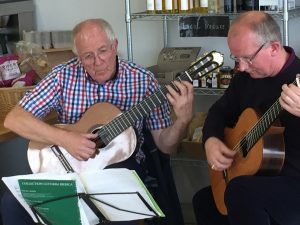 Keith has already started a rehearsal programme for the society’s ensemble, with plans to perform at the Ards Guitar Festival next April and to feature a charity concert early in 2019. I want to encourage all those members who have not been involved to seriously consider joining the ensemble. There is great camaraderie at rehearsals. Performing in ensemble provides an opportunity to develop your performance skills. If you haven’t played in this format before, you will be amazed at what it does for your sense of rhythm, timing, counting and listening skills! Hi folks – friendly reminder that the annual BBQ is taking place this weekend on the 1st of July. All are welcome – please contact the secretary for directions and more information. Also, the L-Derry guitar weekend will take place in the Cultural Centre at 37, Great James Street in the city (http://culturlann.org/) Sat 25th and Sunday 26th of August. Sean has negotiated the use of this venue for the full weekend so we should have access to a range of rooms between 9am and 5pm each day. I have suggested to Sean that the we begin each day formally at around 10am in order to allow people to travel for just one day if they so wish. Also we can finish both days with a members’ recital so that everyone gets an opportunity to perform at some stage during the event. Sean will construct a programme around this framework and this will include a short recital by Sean himself of pieces which he can still play in spite of the focal dystonia. The cost of the weekend will be £40 per head (£20 for one day only). Of this £25 will be for Sean’s fee and £15 for the room hire with the balance being being paid from CGSNI funds. Although the response has been excellent, and there are 16 people interested in attending all or part of the weekend, there is still time to register an interest with Keith. This should be a great event and we hope you can attend and support it! Next Sunday 3rd June (and not 10th June as previously posted) is the Society’s AGM and we would welcome you to attend. If you have any matters which you would like discussed please bring those forward. The AGM will take place at 3pm in Ulster College of Music. Unfortunately the Derry Guitar Festival will not take place this year due to funding issues but the society is to have its director Sean Woods for a weekend of workshops, ensemble and master classes in Derry. It will be the usual Bank Holiday weekend in August and scheduled to run from Sat 25th to Sun 26th August. It would be best to arrive on the Friday evening so that all of Saturday and most of Sunday would be available. Sunday night is usually a Gala Concert but a members’ recital could take place at that time. Members (and anyone else who would be interested) should contact the society or Keith to express interest as soon as possible! Damien and Norman are both from Portstewart and will be playing a variety of classical guitar music from 3 centuries by composers including JS Bach, Antonio Vivaldi, Ferdinando Carrulli, Turlough O’Caraolan, Scott Joplin and others.